The world is likely to build so many fossil-fuelled power stations, energy-guzzling factories and inefficient buildings in the next five years that it will become impossible to hold global warming to safe levels, and the last chance of combating dangerous climate change will be “lost for ever”, according to the most thorough analysis yet of world energy infrastructure. Welcome to the October/November 2011 issue of the TCCPI Newsletter, an electronic update from the Tompkins County Climate Protection Initiative(TCCPI). Six hundred student volunteers from Cornell University visited over 8,000 households in Tompkins County on October 29 to hand deliver free bags containing a compact florescent light-bulb and information on ways to save money on energy. The event marked the 20th anniversary of “Into the Streets,” Cornell’s annual day of community service – sponsored by the Cornell Public Service Center. The energy savings bags are part of an upcoming county-wide campaign, “Get Your GreenBack Tompkins,” which will launch in January, 2012. Cornell Students go "Into the Streets" to raise awareness about energy efficiency. Educational materials in the bag included low and no-cost energy-efficiency measures residents can take to save money, an application for a home energy assessment (worth over $400); alternative transportation options, how to buy more local food, and reduce the cost of waste disposal. The materials also provided information on the “Get Your GreenBack Tompkins”campaign, including an entry ticket for a raffle for a chance to win over $2,000 in prizes from local energy efficiency retail product providers. 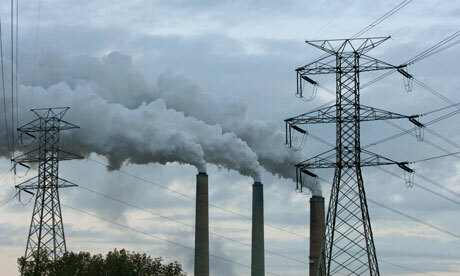 Preparing the first Climate Action Plan (CAP) can be a difficult task. With this in mind, Witold Bujak, Sustainability Manager at Rochester Institute of Technology (RIT) offered to approach it in a systematic way by dividing the assignment into separate, easy-to-manage tasks. Task One – Understand the Assignment. This was relatively easy, thanks to the vast resources available on the web. The American College & University Presidents’ Climate Commitment (ACUPCC) website reveals the Commitment’s protocol and reporting instructions. But the real treasure is in the online reporting system, a quick reading of just a few reports from other universities shows a variety of campus responses to the same challenge of reporting, planning and creating a long term approach that would achieve neutrality and sustain financial resources. At the recent 2011 AASHE conference, Clean Air-Cool Planet (CA-CP) unveiled the next phase of the Campus Carbon Calculator™ evolution: we’ve partnered with Sightlines, LLC, to redevelop the Campus Carbon Calculator as a dynamic, web-based solution. The goal: to streamline the transition from analysis to action with a simpler, more powerful tool. Back in 2001, CA-CP partnered with the University of New Hampshire to develop a template for campus greenhouse gas tracking. That Excel-based template — better known as the Campus Carbon Calculator™ — has since become the most widely-used carbon management tool in higher education, evolving with user needs to become increasingly comprehensive while remaining transparent, customizable and free. To lead in the transformation to a sustainable society, institutions of higher education need to clearly articulate their own sustainability objectives and show progress toward meeting their goals. A set of regularly updated sustainability metrics is one important tool that can help keep stakeholders engaged and encouraged to focus on continual improvement. Internal performance metrics and external public reporting are growing areas of importance for sustainability in higher education. Some campuses are reorganizing or expanding their sustainability teams to include positions that focus specifically on measuring and reporting progress. Five years ago AASHE was called upon to develop a consistent way to measure campus sustainability efforts, and the idea for STARS – the Sustainability Tracking, Assessment & Rating System – was born. In January 2010, after a year-long pilot program and several public comment periods, AASHE launched the first version of STARS where institutions could register to participate and receive a rating. In addition, the American College and University President’s Climate Commitment (ACUPCC) celebrates the 5th year anniversary of the initiative and the upcoming first round of Progress Reports on Climate Action Planning. Public reporting is an important component of the transformation of higher education as it allows us to track, assess, and learn from our progress toward sustainability. How has the process of reporting developed throughout the history of the campus sustainability movement? Let’s take a trip back in time to the early years of the campus sustainability movement to learn how the development of both the ACUPCC and STARS reporting systems have developed for the benefit of campuses nationwide. Check out the following update from Bowdoin College regarding progress toward their target of climate neutrality by 2020. The letter from President Mills is an excellent example of ongoing active involvement and communication from the president; a critically important aspect of climate action planning, to ensure the community understands it is an important, strategic goal of the institution. The animated video from Bowdoin student Maggie Williams is not only impressive, but another great example of a successful climate action process: involving students, and engaging other disciplines (like art and communications) as part of the education for sustainability experience. “Announcing word of a 16% reduction in greenhouse gas emissions since the College’s carbon reduction plan was adopted, President Barry Mills, in a letter to the Bowdoin community, urges everyone to learn how simple changes can have a significant impact in this ongoing effort. “Bowdoin is an institution and a community dedicated from its founding to serving the Common Good, and there is no doubt that preservation of our environment falls within this historic charge,” writes Mills. The Campus Energy Efficiency Fund is a first-of-its-kind investment that can generate as much as $45 million in improvements at as many as 12 schools through projects creating more than 700 new jobs. Over the 20-year useful life of these projects, schools are expected to save $150 million in utility costs and reduce their carbon dioxide footprint by 1.4 million tons – or the equivalent annual emissions of 250,000 cars. Blue Hill Partners will manage the Fund, which offers a promising model for ramping up energy efficiency efforts, and driving down energy consumption – saving money, reducing carbon emissions and creating jobs. Engaging with the community to build sustainable and thriving regional economies is an important pursuit for higher education. For community colleges, in particular, this quest is also a fundamental part of what they are and who they serve. Community colleges were founded on the principle of service to the community. Most community college students are local residents who stay in the region. Sustainability practices learned at the college, therefore, are likely to be applied locally as those students become part of the fabric of that community. Colleges also serve thousands of local residents and businesses through continuing education, small business support services, and workforce programs. These are critical vehicles that colleges are using to inform the public (i.e. local consumers) about the importance of environmental stewardship and how to take advantage of green technologies like solar panels or sustainable building products. In addition, outside the campus, colleges are key stakeholders in a growing number of regional climate and energy partnership initiatives to reduce community energy consumption or advocate for revised local environmental policies. 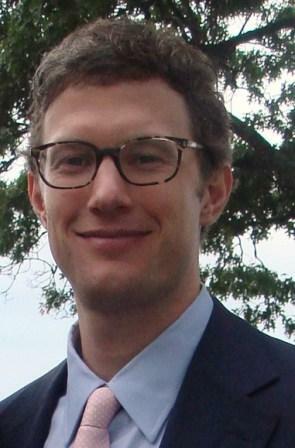 Historian Geoff Blodgett once wrote that “Oberlin has always been preoccupied with the moral issues of the day.” That legacy is evident, notably, in Oberlin’s leadership in race-blind admissions and co-education. In the 21st century moral issues will be far more daunting and difficult than ever before, but mendacity, confusion, evasion, and paralysis are rampant in high places. In the summer of 2009 the College reconceptualized and joined four otherwise disparate objectives as an overarching initiative, the Oberlin Project. In affiliation with the City, we aim to revitalize the local economy, eliminate carbon emissions, restore local agriculture and forestry, and use the entire effort as an educational laboratory applicable in virtually every discipline. Embedded in the American College & University Presidents’ Climate Commitment (ACUPCC) is the notion of leadership by example. By committing their institutions to the goal of carbon neutrality, the presidents who are signatories to the ACUPCC underscore the critical role of higher education in meeting the challenge of climate change and building a more sustainable future. Universities and colleges in the United States have historically been crucibles of social change and laboratories for new ideas and creative solutions to some of society’s toughest problems. In this sense, the ACUPCC is part of a long tradition in our country. What is new, however, is the scale of the problem and the threat it poses to human civilization. Simply providing a model of sustainability will not suffice this time around. Campuses can only truly become sustainable if the communities around them are sustainable. In this sense, implicit in the ACUPCC is the commitment to not only dramatically reduce the carbon footprint of the university or college, but also collaborate with the larger community in doing so. Welcome to the September 2011 issue of the TCCPI Newsletter, a monthly update from the Tompkins County Climate Protection Initiative (TCCPI). In the works for several years, the Enfield Energy Black Oak Wind Farm project has gained new momentum in recent weeks. The company held a meeting at the Tompkins County Chamber of Commerce earlier this month with potential board members. At the meeting, Enfield Energy’s co-owner and project manager, Marguerite Wells, reported that construction on the 35-50 MW Black Oak Wind Farm site is slated to begin in late 2012 or early 2013. Adopting a financing model developed by the South Dakota Wind Partners(SDWP) project, Enfield Energy plans on making an in-state public offering of the company as a way to raise the necessary capital. Consultants from the South Dakota firm Val-Add Service, which served as the project coordinators for SDWP, explained how this approach works and why they thought it would be a good fit for Enfield Energy, given its commitment to community ownership. Maple Ridge Wind Farm in Lewis County, NY. For a small college of 500 students located in a rural community of Maine, Unity College has been nothing short of a bright star for its proactive leadership in addressing sustainability and climate actions in the higher education sector. As a result, the institution recently received an anonymous and very generous gift of $10 million to support its mission of education for sustainability. The college President, Stephen Mulkey, delivered this great news in his first “State of the College” address, which was received with erupted cheers and applause from the staff, students, and community members. President Mulkey acknowledged that the donation would allow Unity an opportunity to enrich its curriculum and educate students for careers in sustainability that reflect the needs and development of 21st century. According to Robert Constantine, Vice President for College Advancement, the gift has tripled the institution’s existing endowment and created $500,000 in additional operating revenue. While the college community has been ecstatic about the great news, the gift is undoubtedly a tribute to the college’s hard work as well as its ongoing efforts towards campus sustainability and climate neutrality1. Earlier this week I had the pleasure of attending an excellent event co-hosted by Citi and EDF on Innovations in Energy Efficiency Finance. As you can see from the agenda below, it was a fully-packed day with an all-star cast of panelists diving deep into the barriers and solutions to financing energy efficiency projects. Panelists said financing was the biggest barrier to energy efficiency. This is the same message we hear consistently from colleges and universities, which has led us to create the ACUPCC Financing Committee, and financing webpage on the topic. Colleges and universities that sign the ACUPCC become part of a vast network of schools leading society towards climate neutrality by implementing climate action plans that address education, research initiatives, community engagement, and campus operations. Good news! 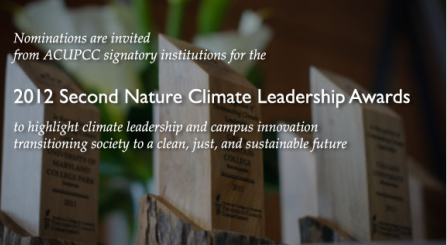 There is still time to nominate your institution for a 2012 Second Nature Climate Leadership Award - the application deadline has been extended to November 30th! Application is 500 words or less -get started on your nomination today! to transition society to a clean, just, and sustainable future. Second Nature is pleased to announce a partnership with Planet Forward, the web to television initiative that asks citizens and experts to share energy, climate and sustainability innovations, to highlight the leadership of the ACUPCC network. All finalists will be featured on the Planet Forward website by producing a short video highlighting the institutional leadership outlined in their nomination. Engaging students in the process of fulfilling the ACUPCC is a great way to get things done - completing greenhouse gas inventories, creating a climate action plan, implementing specific projects, and reporting on progress. But more importantly, it provides a variety of excellent experiential education opportunities, exposing students processes and systems that will be in growing demand in workplace. Students can gain marketable technical skills related to carbon accounting, reporting, renewable energy systems, green building, and more. There are also a whole host of relevant disciplines where students can earn valuable experience, such as economics and financing, law and policy, and strategic planning and management. Maybe most important, it's a chance to experience firsthand how organizations work, and the exciting challenges of managing complex change. The Campus Climate Neutral project from the National Association of Environmental Law Societies (NAELS) has helped many schools engage students in climate action planning process, including UC Santa Barbara, Tulane, Bard, and the University of Arizona. The Climate Corps Public Sector program from the Environmental Defense Fund (EDF) is also training students and placing them in internships on campuses to conduct energy audits and make cost-saving recommendations for energy reductions. The UNCF Building Green at Minority-Serving Institutions Initiative has emerged as the coordinating collective for sustainability efforts targeting historically black, tribal, Hispanic-serving and Asian American Pacific Islander, public and private, two-year and four-year colleges and universities. This visionary Initiative is funded by the Kresge Foundation and has been strategically supported by our partners. The Building Green Initiative partnership includes the Thurgood Marshall College Fund, American Indian Higher Education Consortium, Hispanic Association of Colleges and Universities and Second Nature. The Initiative also works with the National Association for Equal Opportunity in Higher Education, Asian American Pacific Islander College Fund and American Association of Community Colleges SEED program to advance campus-wide sustainability at minority-serving institutions. Increasing signatories to the American College & University Presidents’ Climate Commitment and LEED building are two specific program objectives. The Building Green Initiative hosts learning institutes, workshops and webinars that provide education and training for administrators, faculty and students engaged in advancing campus sustainability. UNCF seeks opportunities to partner in ways that leverage available resources to build capacity within partner organizations and their membership as a core partnership principle and Initiative goal. Financing has been identified as a key barrier to implementing sustainability projects on campus. The ACUPCC Financing Sustainability Committee has been meeting since January 2011 to address the lack of information about available financing resources and to discuss strategies to encourage the federal government, and other funding sources, to increase support to signatories for energy efficiency and renewable energy projects. During the ACUPCC Steering Committee Meeting at the June 2011 Washington, D.C., Annual Summit, two central, specific goals around financing were affirmed: 1) To help a specified percentage of the higher education community reduce on-campus energy consumption by 50% and achieve 100% renewable energy use within a decade; and 2) to move colleges and universities away from the notion that efficient and renewable energy projects have to pay for themselves—rather, we urge our fellow institutions to allocate funding for sustainability initiatives as part of their strategic planning process. A third goal is to develop resources on the ACUPCC website to enhance its effectiveness as a clearinghouse for information to identify and secure financing opportunities for sustainability initiatives.